It’s all about you; take back your ceremony! It is a ritual – time honored and sacred – but that does not mean your wedding ceremony has to be like every other. Of course, some couples choose to be extremely original and opt for exchanging vows on a roller coaster, while bungee jumping or even dressed as trekies. We say – good for them for such uninhibited displays of originality. 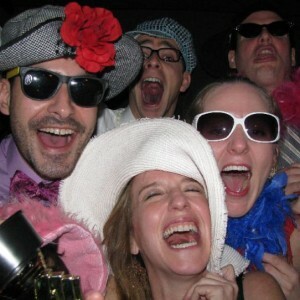 But even if you prefer a more traditional and “scream-free” wedding ceremony, you can still add a touch of personality. Not every wedding ceremony must take place in a house of worship. Outdoor locations and other types of ceremony sites can make for ceremonies that are both spiritual and memorable. Consult our list of unique ceremony site ideas for inspiration. Welcome and refresh your guests by serving lemonade, iced tea or water. It’s a nice touch, and your guests will appreciate the gesture. Depending on the season or nature of your wedding, you can use your refreshment of choice to tie in the theme or style of the day. Who says your ceremony decorations must be floral? How about draping framed photographs of the bride and groom tied with ribbon over the ends of each row? Our post about wedding flowers can help you create a unique and memorable decor scheme. Summer brides – how about the shape of a fan? Or keep the shape and style traditional, and include personal letter or poem to add some interest to this often overlooked detail. This complete wedding programs guide offers even more ideas to get your creative juices flowing. There are other ways to make your entrance beyond the traditional march with your father. Ride in on a horse. Or be escorted by both parents, a close uncle, brother, friend—even a pet! Here is a list of grand introduction songs. You will know this is your ceremony while walking down the isle on a runner personalized with your monogram or logo. If walking down the isle to the same song as thousands of brides before you doesn’t sound appealing, there’s no reason why your favorite tune can’t make a memorable substitute! Instead, combine sand into a beautiful bowl or vase. The sand can be of two colors, creating a visual representation of the joining of two families and something you can keep and cherish forever. 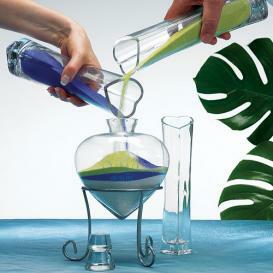 You can purchase a sand ceremony kit in our wedding store. Nothing puts that special personalized stamp on a ceremony quite like vows and readings prepared by the bride and groom themselves. These spoken words expose your mind and your heart to each other and to your audience. Get started with these tips on writing your wedding vows.